Gleason L. Archer (B.A., M.A., Ph.D., Harvard University; B.D., Princeton Theological Seminary; L.L.B., Suffolk Law School) is professor emeritus of Old Testament and Semitic languages at Trinity Evangelical Divinity School, in Deerfield, Illinois. He continues to teach part time at TEDS and has served as a minister of the Evangelical Free Church of America since 1966.Archer's books include Job: God's Answer to Undeserved Sufferingand Old Testament Quotations in the New Testament. He co-wrote A Theological Wordbook of the Old Testament. His instrumental work in the preparation of the Old Testament portion of the New American Standard Bible has gained wide acclaim and positioned him as a world-renowned scholar. 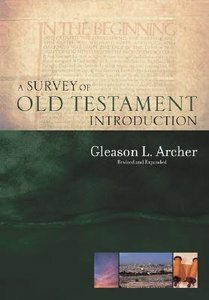 Customer Reviews For "A Survey of the Old Testament Introduction"
An excellent introduction to the critical issues surrounding each book of the OT. Archer almost invariably defends a conservative interpretation at each point, arguing for the authenticity of the text and resolving interpretive difficulties. The book is divided into three parts. The first half of the general introduction discusses critical issues at a general level, introducing the reader to various forms of criticism. The second half of the general introduction is a critique against the Documentary Hypothesis. The special introduction focuses on the interpretative issues that arise in connection with each book of the OT. The appendices are independently interesting and useful material-especially the appendices laying out the timeline of the OT and an enumeration of some of the manuscript evidence supporting the OT texts.